I've been visiting theDaughter this past week. As long as I'm here freeloading, I made myself useful and cooked some of the dinners. Figuring that there must be at least a couple of recipes on the blog that would please her and theFiance, I asked what they wanted. "Mom, can you make stroganoff?" theDaughter requested. Isn't that sweet? She asked for a comfort food I've been making since she was a toddler. Of course, it's a recipe I hadn't gotten around to posting and couldn't remember the exact ingredients. Originally from a La Leche League cookbook, it is stroganoff in name only. It is more like sloppy joe, but without green pepper, and served over noodles instead of a bun. 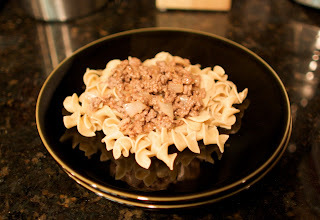 I've made "real" stroganoff (if you can call it that when made with pretend "sour cream"), but whenever someone in the house asks for stroganoff, this is the version he/she is craving.